Wow! First I reread your post using a saw blade..I would never have thought of that one…not even sure I could do it! Today’s tip is amazing…right down to the spritz of water as release! Thank you for sharing! And BTW, your necklace is stunning! Hey thanks Patti. What was surprising to me was that I’ve been drilling rocks like that for quite a few years, and I’ve been using the saw to enlarge pearls for at least a couple of years. I never put the two together until last week! Actually Barb, you are a genius. 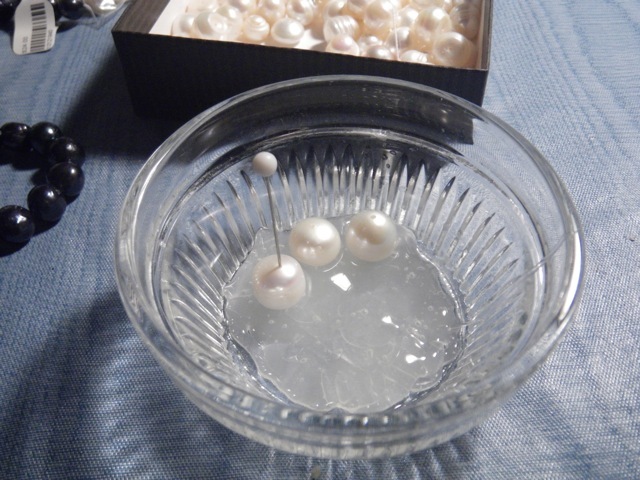 I have been drilling pearls for years and I use a diamond drill bit holding each pearl with my hand under water and drill.with the other hand. Can you believe it? 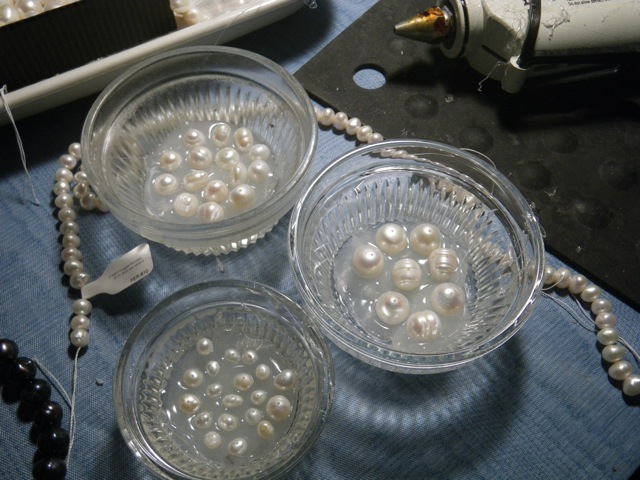 It was always risky that I would slip and drill through a finger and I was only doing one pearl at a time! It was the only way I could figure out how to do it. Plus – I have to admit – the risky part is always a draw for me. Love you. Trish! 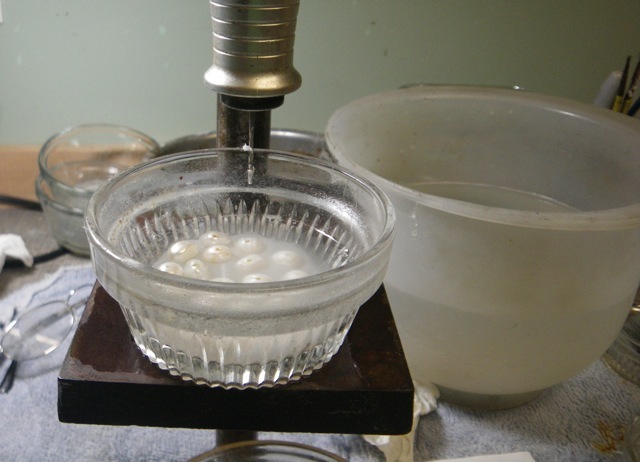 If you end up drilling pearls this way, you’ll have to find a new way to “live on the edge.” How’s western Massachusetts? Maine misses you! Hear me gasp! 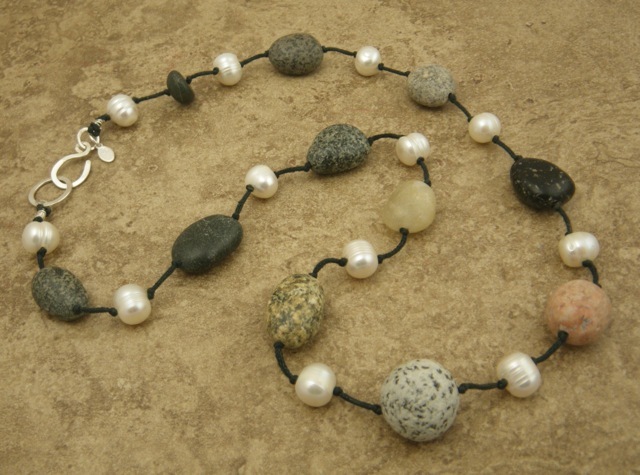 I always loved pearls but the holes were always too small. What a great way of doing it! The necklace is stunning. Thanks Roberta. 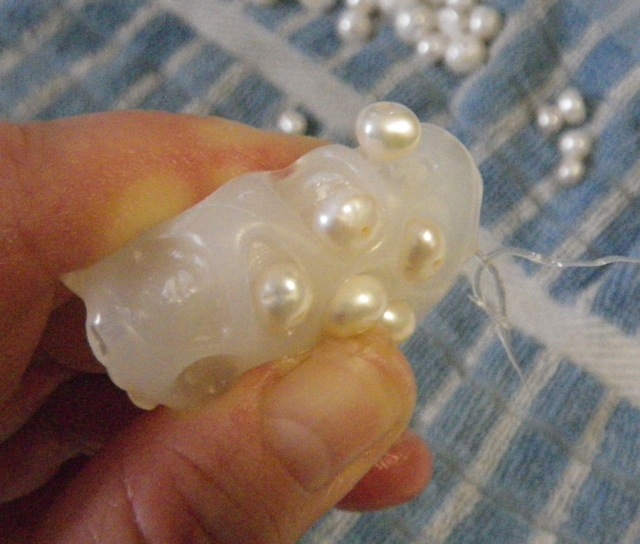 I have to admit I don’t always get those little pearls lined up just right in the glue. Sometimes I drill through and end up with two holes on the other side, the original smaller one, and the new one I just drilled. But it works out for me 95% of the time. patricia is right…you ARE a genius….i’ve always said so! So funny. You know me…my first thought was not: hey, this is kind of clever. My first thought was: why didn’t I do it this way sooner after drilling rocks for so long. My first thought was, How does she get the dried glue off the pearl? Thanks for answering that question! Barb it seems to me not so difficult when you See the picture and explanation, I Will try to drill my pearls under water. But i have a question anyway what kind of glue do you need and use? I use a regular old hot glue gun with glue sticks like you might use for a number of crafts. I spray the container with a layer of water (as a release agent) so I can get the glue off the bottom of the container easily. 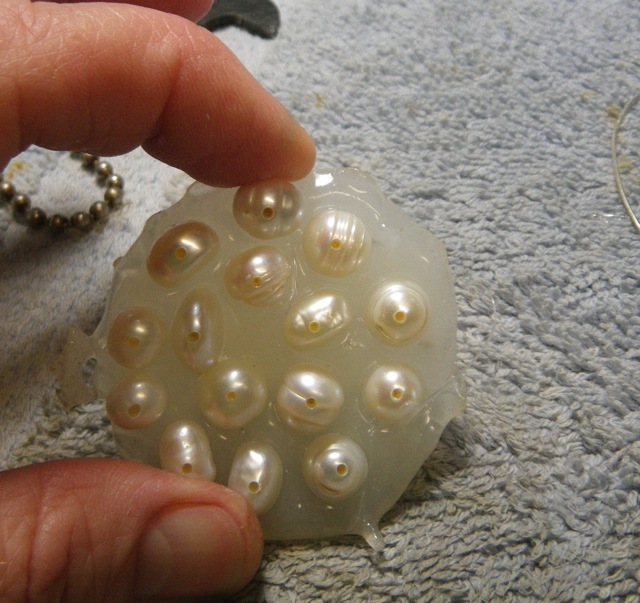 Then I squeeze in a layer of hot glue and set up the pearls. The glue hardens as it cools. Wow – what a great idea! I haven’t gotten around to drilling stones, pearls, etc. yet because I couldn’t think of how to hold them safely. Thank you! Glad you like the idea Natasha! Just make sure you use enough hot glue to set the stones in at least halfway, so they don’t pop out when drilling. I still keep a finger on them while I’m drilling, but the glue helps so much. That’s a great idea! Do you think it would work for drilling shells? I have the hardest time drilling into snail shells (from the beach, not garden snails) because they either move around too much or crack halfway through. I haven’t tried it with drilling shells. I wonder if they would be hard to remove from the hot glue without cracking. It’s definitely worth a try. Drilling through the water might help prevent the cracking as you drill. I usually do drill in water, but snail shells are weird. They are more brittle in spots than they are on others. I’ll let you know how it goes, though, when I try it. Oh those un cooperative snail shells! Good luck. I would like to know how they come out. It has been suggested by several to wear a mask while doing this to avoid breathing in any of the pearl dust. I tried this method and it was a mess. I used a Drexel. I don’t know what I did wrong. Any suggestions? Sorry you had trouble with this, Christina. Maybe the problem was in using a Dremel tool. I used a flex-shaft with a foot pedal to be able to control the speed of the drill. I think a Dremel only runs at a set speed, so that may have been the trouble. I like to be able to start drilling slowly. Cool! I hope this works for you, Jessica. I haven’t figured out a way to do that yet, Mona. Hello Barb, I would never have considered glue as a medium as I’d have assumed they would be stuck there forever. I have on occasion used wax to hold smaller objects in place – not so much for drilling but to hold a nut, large seed or other round item in place in order to paint, etch or work on it in some way. It has worked for me, but, unlike the glue, isn’t flexible. However, if you want to hold a slightly bigger item, wax does work. Use an egg-cup or silicone cup cake mould, supported in metal tray. 1. Melt a layer of wax into a small container. Refrigerate. 2. Hold your object in place whilst you pour more melted wax around your object. 3. Cover slightly less than half way. 4. Paint or dye your object. 5. Reverse the process if you want full coverage. I used the wax because I could re-use it, and because I didn’t even consider glue! The wax can crack, but usually it’s still ok to paint, and it stops my object from rolling around. Great lateral thinking Barb! Wow, thanks for the suggestion, Rael! BRILLIANT ! ! ! BRILLIANT ! ! ! BRILLIANT ! ! ! Thank you sooooooo much for sharing. I have recently purchased a string of baroque pearl crosses with several ideas in my feverish wittle brain. Big step: the hole. Go figure. Thank you again, so very much, for sharing. Great! Hope it helps for your pearls! They sound spectacular! I was looking up different drilling techniques and stumbled on your post. Have you tried using Jett Fixturing Compound from Rio? I plan on buying some. It would seem to do the trick, and it’s reusable, although, I don’t know how I would keep it stationary in a container under water. Maybe a dab of glue under the fixturing compound. Thank you for sharing your techniques! Hi Saadia, I haven’t tried the Jett Fixturing compound. I’d be interested to know how it works for you. I like the idea of reusable. 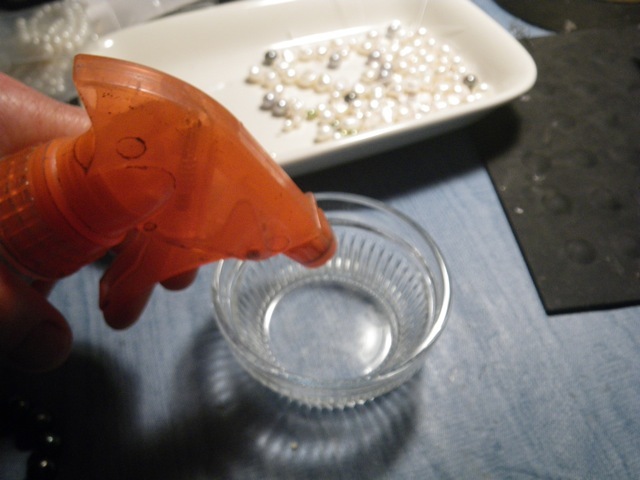 I usually end up holding the glued rocks with one hand while drilling, just as a precaution. 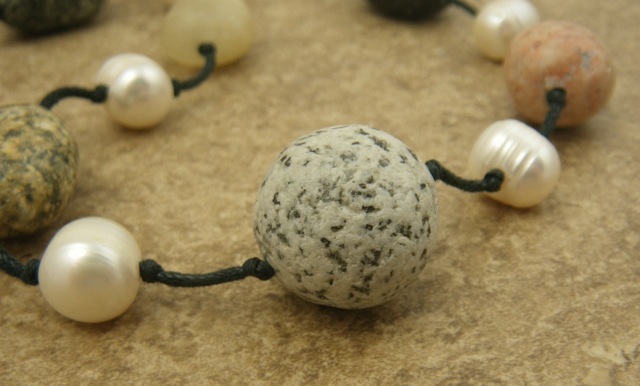 I don’t have to hold them tightly, but just hold the glue and rocks in place with downward pressure. That might work with the fixturing compound. Happy drilling! You should explain that pearl dust is toxic released into the air if breathed in thus always drill under water to prevent airborne pearl dust. Thank you Cindy. A good point. Thanks for this amazingly ingenious idea! There is always more than one way to skin a banana (the cat reference turns my tummy). You are so creative, lovey jewelry. Thanks again! Thank you for this post. 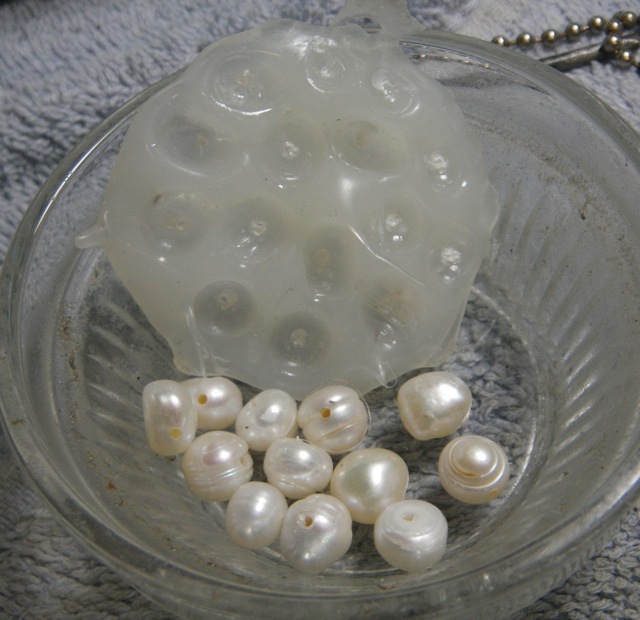 I want to make pearl and leather jewelry. Lots of pearls but holes to small thank you. Thanks, Teri. I’ll have to try the sticky tack. The one thing I don’t like about the hot glue is that it only has a one time use.